Please read our Terms & Condtions below. In any dispute, you will be deemed to have read and understood all the conditions below. PAYMENT: Your fully completed booking form must be accompanied by a non-returnable deposit of 25% of the total rental. When we receive your booking form and deposit we will send you written confirmation. There is no contract between us until this confirmation has been sent and it acts as our acceptance of your booking in accordance with the conditions outlined here, subject to English Law and jurisdiction. The balance due shown on your deposit receipt, must be paid not later than eight weeks before the arrival date. If you fail to pay the balance by the due date, we reserve the right to treat the booking as cancelled, and you may be liable to pay the cancellation charges up to 100% of the final balance payable. N.B. Bookings with less than 8 weeks to arrival require the total payable at the time of booking. Normal Use of Electricity, gas, water and end-of-stay cleaning charges are included in all prices. Electricity usage is based on average readings of meters in previous rental periods. Some properties do not include these charges and this will be shown on the individual descriptions as an extra charge. Excessive usage will also be charged for. Normal cleaning means the property should be left as found. Properties left in an excessively unclean state will incur penalty charges. Garden/pool maintenance is included .In some properties gas/water is extra, but this will be pointed out to you. Most villas have complimentary maid service included in the price. Bed linen and towels are not provided in all properties. In which case, linen can be hired or clients can opt to bring their own. PHONES MUST BE ORDERED prior to arrival but not all properties have phone lines. All extra/special requests must be paid for prior to arrival. Changes to the original booking form incur a supplementary charge of £20. REFUNDABLE SECURITY DEPOSITS: These are requested by all property owners to cover the cost of minor damage etc. And to pay for any phone charges incurred. This deposit is payable to us at the time of payment of your final balance. This is returnable less any costs incurred within a maximum of 28 days from the date of departure. INSURANCE: Proof of your own insurance covering damage to the rented property is mandatory. Failure to prove or take out insurance as outlined in the Insurance Leaflet will necessitate Azur Villas Ltd (AV Ltd.) taking out insurance on your behalf and automatically deducting the appropriate premiums from your security deposit for all people in your party. DAMAGE AND BREAKAGE: You are responsible and liable for all damage/breakages during your stay, whether accidental or negligent. You should inform AV Ltd before departure from the property and replace or pay for whatever has occurred. In the event of damage/breakage being discovered after your departure, the cost of repair/replacement will be deducted from your security deposit. Major items will necessitate insurance claims with any excess payable deducted from the security deposit. INVENTORIES: Most properties have inventories. It is in your own interest to see that this is accurate so that any loss/damage is not wrongly attributed. Please inform us of any discrepancies/malfunctions within 24 hours of arrival, after which time you will be deemed to be responsible. ARRIVAL AND DEPARTURES: Normal arrival times MUST NOT be before 16.00 hours. You are requested to vacate the property by 10.00 hours. Late departures may incur extra charges. Unusual hours of arrival/departure may be arranged at extra cost and any necessary key collection must be at pre-arranged times otherwise WE CANNOT GUARANTEE entrance to the property on that day. PLEASE BE AWARE OF THE TIME DIFFERENCE between countries. Times quoted are C.E.T. Please allow for flight delays, weather/traffic conditions which may necessitate an overnight stay in a hotel. Call us en route if unforeseen circumstances mean you will arrive after 19.00 hours. WE CLOSE WITHOUT FAIL AT 21.00 HRS. PRECISELY and re-open at 9.00 hrs. When reserving flights you should bear in mind the above as unsociable arrival times mean access to the property is ON THE FOLLOWING DAY ONLY. If for any reason we have to make alterations to your arrangements, we will notify you immediately and try to offer you accommodation of a similar standard. Should this not be acceptable, we will refund your payment in full. If alterations have to be made during your stay we will do our best to maintain the overall standard of your holiday. IMPORTANT NOTE: The provision of 8. will not apply if the major change is caused by circumstances entirely beyond our control. We reserve the right to cancel the holiday before or after payment of the final balance and we will offer the choice of a comparable alternative holiday or a prompt refund of all monies paid to us. If you cancel the holiday at any stage you may be liable for the full amount of the cost of the holiday or the balance outstanding if the deposit has already been paid. Although we will make every effort to re-book the holiday with another client, this cannot be guaranteed and in the event of a re-booking there may be a price difference at short notice from the original cost for which you may be liable. We reserve the right to terminate a holiday without notice where the behaviour of the client or members of his/her party is causing annoyance, distress, damage or danger to the property owner, the property or a third party. No refunds will be made in this event. We also reserve the right to ask clients to leave a property that is over-occupied whereby the occupancy is clearly stated on the property descriptions. Care is taken to ensure descriptions of properties are accurate and are written in good faith. Should a facility not be available, we will do our best to arrange an alternative but this may not be possible or feasible. Occasionally some repair/maintenance beyond our control may affect some facility. Most swimming pools should be made safe by protective barriers, alarms, covers or some other form of security. The responsibility of this falls on the owner of the property to supply and AV Ltd cannot be held liable should this security not be in place nor for any mishap occurring through the negligence of clients to use these measures. Minors in a party remain the responsibility of their parents/guardians and must be supervised at all times in or near pools. Our responsibility is only in choosing and recommending the property to you. No such extent as is provided in the Misrepresentation Act 1967 and the Unfair Terms Act 1977 applies. We do not accept liability for any loss, damage or additional expenses incurred by you or any member of your party in connection with the holiday, whatever the cause, EXCEPT where there is proven neglect by the property owner or AV Ltd. We do not control nor own the property you have booked and in that event we are not liable for any injury, death, loss, inconvenience or damage which arises outside our normal inspection process. While every effort is made to perform the contract, we cannot accept liability for alteration, delay or cancellation of your holiday because of war, threat of war, riot or civil strife, terrorist activity ( threatened or actual), natural disaster, fire, sickness, weather conditions, action at an airport or port by any governmental or public authority, technical problems relating to transport, airport regulations, temporary, technical, mechanical or electrical breakdown with your accommodation or other circumstances amounting to 'force majeure' or Acts of God and other similar events beyond our control. 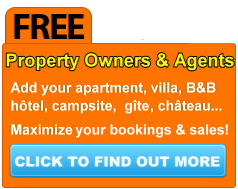 AV Ltd. and the property owners do our best to give you an enjoyable holiday. If you have any complaint, the onus is on you to report it immediately so that action can be taken straight away to rectify the fault. We cannot accept liability for complaints after return to your home country unless they have been reported during the holiday and sent in writing to us within 28 days of departure. All Pools at rented properties in France are required by Law to have some form of pool protection whether an alarm, protective fence or cover. It is the owners' responsibility, not that of Azur Villas Ltd, to provide approved protection and the client's responsibility to use the protection offered according to the instructions given. Accidents arising from the client's lack of use of the pool protection are deemed to be that occupying client's responsibility. At no time under whatever circumstances is the pool protection to be deemed a substitute for the lack of supervision of minors by their parents or guardians.